The slick and convenient Tornado refillable butane torch lighter is perfect for toasting your favorite cigars, even when you're on the go. Ergonomic design allows for a perfect grip, and a powerful torch flame ensures an even light, every time. got it for free with my order, perfect all around single torch when lighting or touching up the burn on your stogie without charring half your cigar like with triple and quadruple torch lighters. Product does what it subpost to do. The one I received was broken. I don't care for the locking mechanism to have to jerry rig to open. I would not recommend this to anyone. It looks sleak, but that's about it. Better quality than expected for a cheaper lighter. I have been unhappy with this product. It seems to regularly stop working properly. I dropped it and it fell/came apart, so this casing is NOT Carbon Fiber. I had to super glue it together in order to keep using it. Very good lighter for the price. A must have in the boat while fishing, it's windproof! Good lighter. A little difficult to fill, but once done light my cigars well. Works good, takes a bit to get the knack of the safety aspect. I would rather have a price drop on the cigar instead. Difficult to work especially with lighting cigars of larger ring sizes. The lighter looks great, but doesn’t work. I’m filled the lighter, adjusted the flame control, but still cannot get it to light. I mostly order Quorum cigars. They are good cigars and the price is right for me. Not a great performer, weak torch and needs to be refilled often. Not working very well ? Neat little lighter but tricky to operate. Once I passed the IQ test and got it opened it worked great! Dual flame with good wind resistance. Nothing fancy but nice curved edges so it doesn’t snag or catch. Appears very durable. Never used it - short life span. Great lighter. Fuel lasts a long time, small enough to take with you and it was a free gift from BCP. 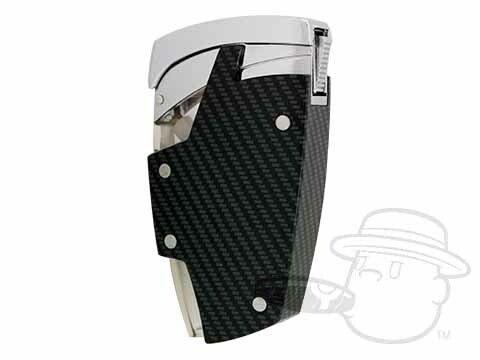 Tornado Torch Lighter - Chrome And Carbon Fiber is rated 3.3 out of 5 based on 94 customer ratings.